You’re looking for a guilty-free snacking pleasure? 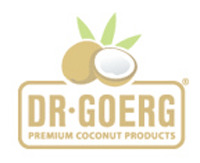 Look no further: the Premium Sweet Toasted Organic Coconut Chips by Dr. Goerg taste like something right out of heaven. Those sweet and easy Toasted Chips reel you in with numerous beneficial nutrients you won’t find in potato chips and the like. The whole coconutty goodness is caramelized with Organic Macobado Cane Sugar – simply heavenly! Dr. Goerg Premium Sweet Toasted Organic Coconut Chips are obtained from monitored organic cultivation and are 100 % all-natural. Initially, the chips are gently roasted and then caramelised in high-quality whole cane sugar which contains many beneficial vital substances. No artificial flavors, no preservatives, no color or other additives – there‘s just full natural goodness in our cans. The sweet organic coconut chips are not only the perfect snack – they also add that something special to desserts, fruit salads and yoghurt. Looking for a party snack? Those sweet toasted chips will make any host happy. The air-tight packaging helps to keep this organic treat fresh and crispy. Since the sweet coconut chips are roasted and caramelised, they are not available in raw food quality.